10" Blade Runner Carrying Case ($23.95 value) shipped with 6", 8" or 10" Dado Sets. Protects circular saw blades in transit and storage.  Accommodates mounting to pegboard hooks. 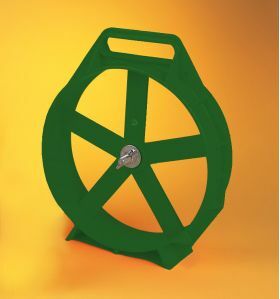  Circular sheath prevents damage to carbide blades, even if case is dropped.  Locking steel arbor can hold up to 10-10" blades (5 per side).  Made from high impact plastic.  Convenient carrying handle.  Sides are marked sharp and dull to keep track of blade condition.  Unit is self-supporting and will stand on any level surface.